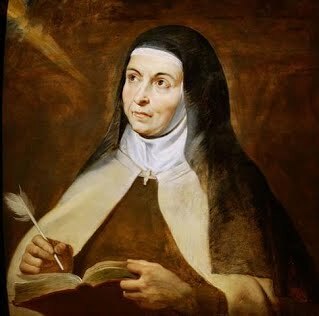 St. Teresa of Ávila - My Catholic Life! The call for reform of the Church has rung out through the centuries down to today. But it is largely misplaced. Reform of Church structures is required periodically for her internal well running. But purification is needed more than reform. The constant purification in holiness of the baptized is harder, more efficacious, and more enduring than the reform of Church organs of governance. Today’s saint was a reformer, but a purifier first. She purified herself, her religious sisters, and then the Carmelite Order. Structural reform came last, after she had died. Saint Teresa of Jesus, commonly known as Saint Teresa of Ávila, was the great inspiration for the great Teresas who followed her: Saints Thérèse of Lisieux, Teresa Blessed of the Cross, and Mother Teresa of Calcutta. Saint Teresa was born behind the high and thick walls of Ávila in central Spain, amidst that country’s greatest century. She was from a large, middle-class and pious family. As a girl, Teresa dreamed of being a martyr, or a hermit, and loved to repeat the words “forever and ever and ever.” When she decided to become a religious, she entered Ávila’s Carmelite convent mostly because it was there. The convent was large and the nuns serious. But it was a bit too comfortable. Many nuns brought their social status into the cloister and had private kitchens, oratories, and guest rooms. Teresa was one of these. Visitors came and went at will. While the convent caused no scandal, it produced no saints either. Even so, Teresa remained faithful—she prayed, observed the rule, and endured the normal fasts and mortifications. But by the mid-1500s, the tide of Church reform, even spiritual reform, which had been rising in central Europe for decades, arrived at the door of Catholic Spain. Teresa suffered various health scares, read some seminal works on mental prayer, had mystical experiences, and slowly became convinced that her convent was too lax. The Church and Christ demanded more. She had developed the practice in examining her conscience to not just weigh her virtues and vices, but to consider all the graces, all the good, and all the holiness God desired of her which she had impeded. Inspired by the great reformers of her century, many of them fellow Spaniards, Teresa decided to found a new Carmelite convent. There was fierce opposition from within her own convent and from the Carmelite Order more generally. Her odyssey of reform, begun in the mid-1550s, bore fruit when her first convent opened in Ávila in 1562. Her sisters wore no shoes (the meaning of the word Discalced), were limited to thirteen per convent, and would accept neither dowries nor endowments. The Discalced Carmelites were to be utterly poor, to fast, to mortify, and to pray intensely. But Teresa also wanted no gloomy saints. She practiced, and expected her nuns to emulate, being even more sociable as she progressed in holiness. Everyone liked Teresa, and she liked to be liked. Teresa spent her last twenty years traveling and living throughout Spain, in the most primitive conditions, founding new convents. By middle age she had earned a reputation for holiness, for legitimate mysticism, for affability, and for total obedience to the Church. She lived what she demanded of others. She led by example. And she did it all with a cheerful disposition and a rich personality that overcame deep-seated opposition. The Discalced Carmelites were given their own Spanish province in 1580 and were recognized as a distinct Order in 1594, twelve years after Teresa’s death. On a banner day in 1622, Teresa was canonized with Saints Philip Neri, Ignatius of Loyola, and Francis Xavier. Teresa was the first female non-martyr to have her feast day extended to the universal Church, and due to the profundity of her mystical writings, she was declared a Doctor of the Church by Pope Saint Paul VI in 1970. Saint Teresa of Jesus, your colorful character and recollected soul merged into a powerful personality that brought about needed change. Through your intercession in heaven, assist all religious to purify themselves and their orders in accord with God’s will for the Church.